There are so many reasons to celebrate you today, from your beautiful spirit to your warm heart. 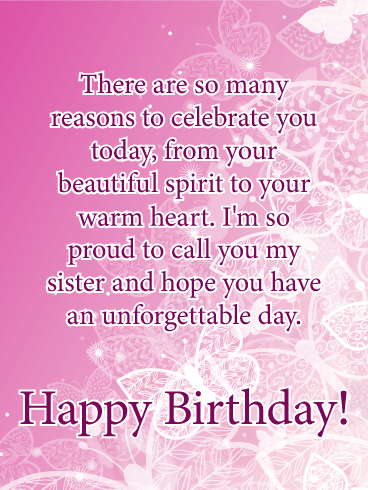 I'm so proud to call you my sister and hope you have an unforgettable day. Happy Birthday! 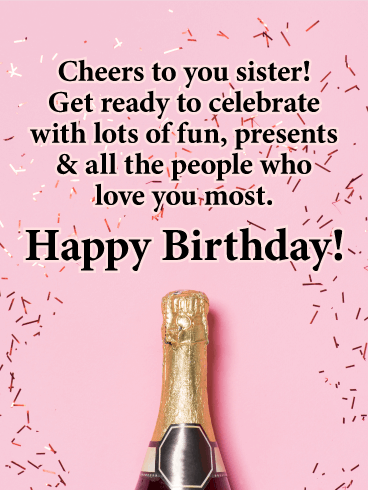 Warm your sister's heart by sending her this loving birthday card for her big day. It showcases a perfect sparkling cupcake and words that will bring her joy. 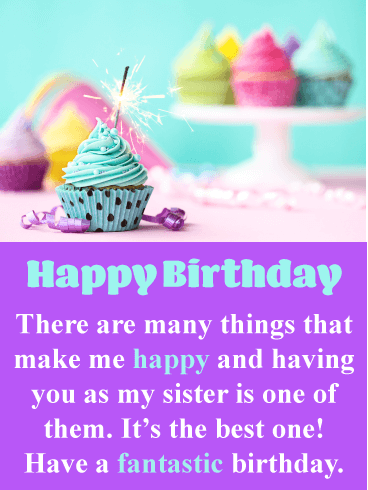 This special birthday card expresses that your sister makes you happy and that she is the best! Birthdays are an excuse to tell someone how you feel about them, so now is your chance! 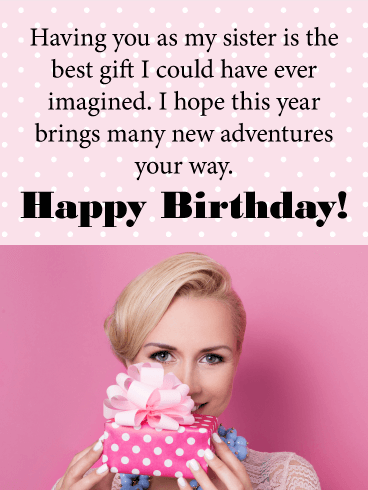 Send this fantastic birthday card her way so she can have an exceptional day! Your sister's birthday is here. It's time to pop the cork, get out the confetti and blow out the candles on another fabulous year! What better way to do that than with this fun and festive card. With a special toast just for her, and a wish for lots of presents and all the people she loves most around her, it's a great way to help her celebrate in style! 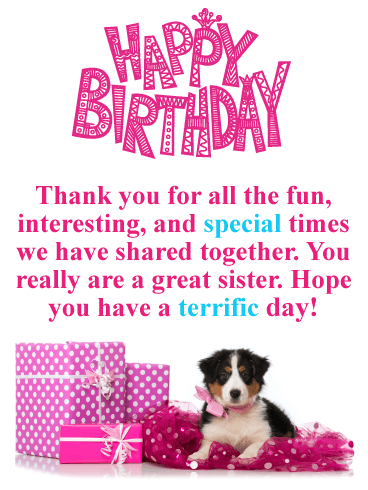 Bold, bright colors make this birthday card for your sister a true standout! 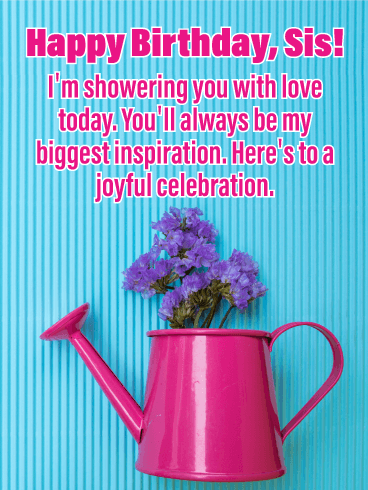 A pretty pink watering can and a rich pop of purple flowers peeking out is set against a charming blue background to instantly brighten her spirits, while the sweet words above will let her know you're wishing her well and hoping she has a joyful celebration. She's not just a sister, she's the best gift you could have ever imagined. And as she celebrates her birthday, this birthday card is a wonderful way to let her know. A smiling birthday girl holds up a sweet pink & white polka dot present, just waiting to see what's inside. It's a reminder that this day should be filled with anticipation and excitement, and that the best adventures in life are still to come. 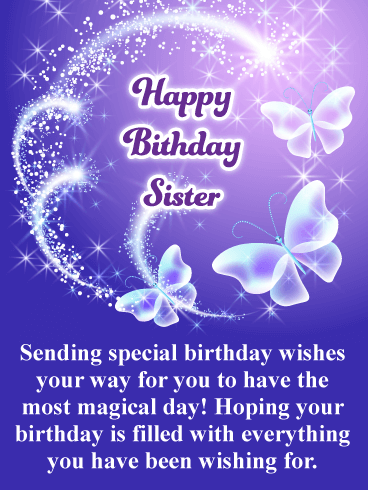 A special sister deserves a special greeting on her birthday. This heartwarming card shows a brother hugging his sis, showing the strong bond between siblings. 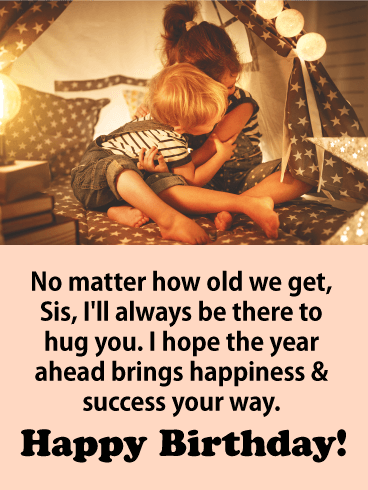 It's a chance to let her know that you'll always be there for her and to wish her a wonderful day and a year ahead filled with happiness and success in every way. 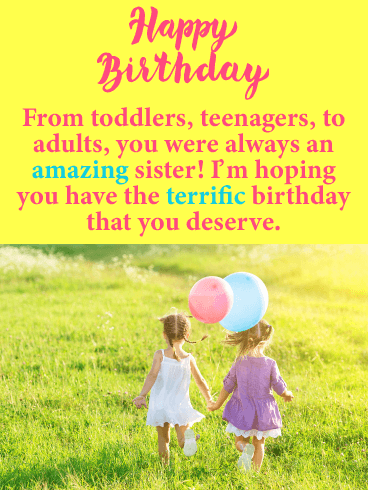 Send your sister a birthday card that will bring back sweet memories. This endearing greeting card features two little girls holding hands and playing. So sweet! The birthday balloons are a nice touch that adds an element of celebration. 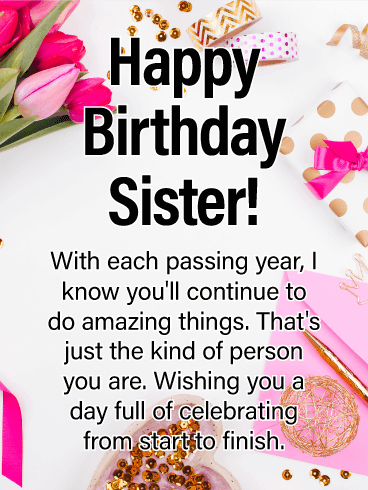 This birthday card expresses that no matter what your age, she has always been an amazing sister! This will certainly make her birthday even more special! These girls can't wait to meet your sister to wish her a happy birthday! 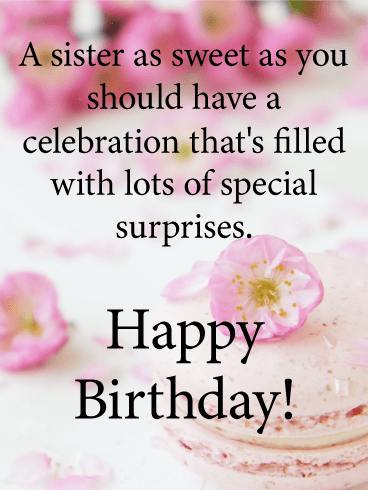 This birthday card for your sister has it all: sweetness, style and sentimental words sure to make her smile. A background filled with flowers, gifts and other trinkets adds a pop of color, while your message is one of inspiration. It's a chance to wish her a memorable celebration and a year ahead that's full of all amazing things for someone who's equally as amazing! You've always looked up to her in so many ways, and now that it's her birthday, it's a great time to let her know! 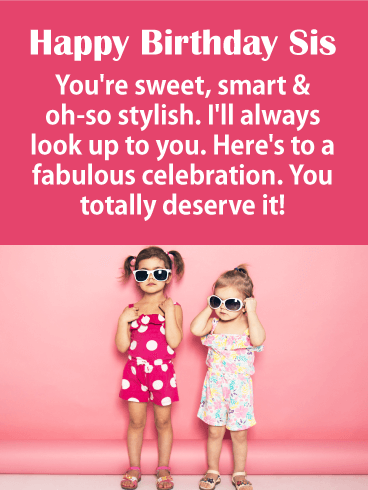 This adorable birthday card with two little sisters in their stylish outfits and sunglasses shows the sweetest side of sisterhood. 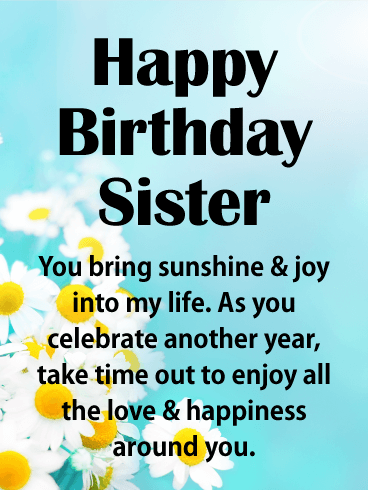 Whether you see each other every day or you're sending your best wishes from across the miles, she's sure to smile and have a fabulous day because of your thoughtfulness. Perfectly wrapped birthday presents and an adorable puppy　wearing a pink bow, it just doesn't get any cuter! This birthday card has it all and your sister will really enjoy it. She will especially love the fact that you are thanking her for all the fun and special times the two of you have had together. Send this little puppy over to your sister to wish her a terrific day and let the celebration start today!